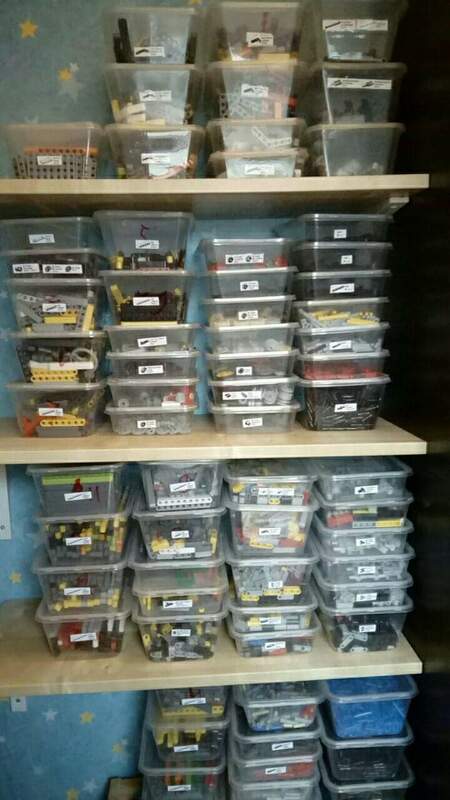 as you may have seen from my previous post a few months back i had approx 100kg worth of lego "classic" or thats what i call it anyway, just regular lego sets, the city stuff some star wars ect ect i managed to build most of that and i have sold most of it to fund my technic habit. now... after sorting all the regular lego into drawers ect i want to use the same system but with technic, can anyone help me with a few pictures maybe of what their lego "workstation" looks like, im just curious as to how many different drawers are used and for what parts, i think im going on the lines of different sized bars in different drawers and then separate smaller drawers for the various connectors, and then screw tidys for the really small axle bits and stuff. as ive not built much technic im not too familiar with what different parts are used and what groups they belong too so any help would be great to use it in the most efficient way possible. I don't have photos by hand, I can post them tomorrow. I use plastic take-out food trays for larger items/quantities, sorting trays for smaller stuff. Start with a rough sort on type (bricks, beams, pins etc) Once you've done that, you can sort more specific per type if needed. This depends on how much you have of each part type. Bricks per size, Beams per size and color (because of quantity), Gears per type (some in large trays, others in sorting trays), Axles per size, Suspension stuf (there are so many miscellaneous parts there that I've just put them together), Pins per type, Connectors per type. Depending in the size of your collection you can determine which storage you can use. The trays I use come in 3 sizes. Didn't want to spend any money on a storage system, rather buy bricks instead of boxes, so I made this myself. I got the card board for free, made small cardboard boxes in two heights and about 12 sizes, and then made the large storage boxed from heavy cardboard. 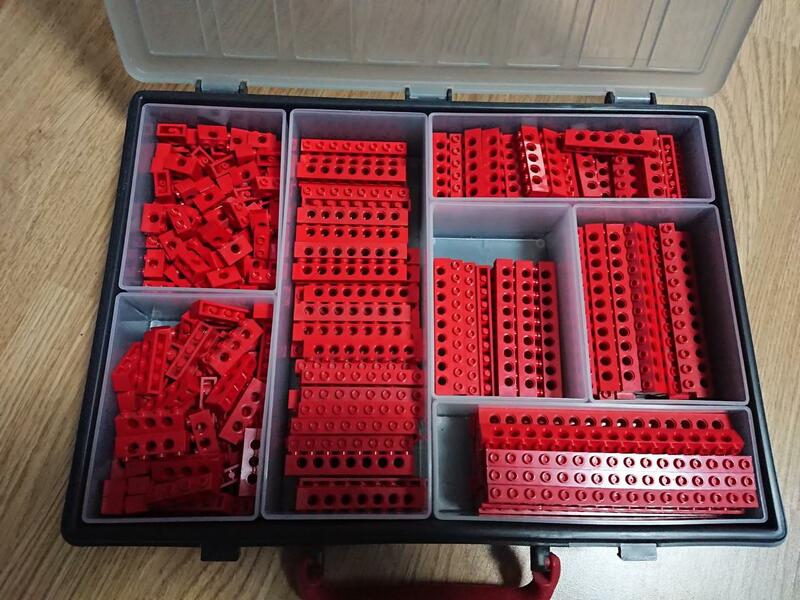 This is just Technic, I got about 60 of these boxes, and a few dozen shoe-box sizes for large parts. Just out of curiosity why are your boxes labelled in English? Obviously your fluent but do you speak it often at home? I started 40 years ago as a programmer, after dropping out of university (Geology) , and been in IT my entire working life. You program in English, not in Dutch. All your documentation (pre-internet) is in English. So I am used to spending 8 hours a day in English, and then coming home and switching to Dutch again. At first, that's not so easy, but after a decade or so, I realized I was actually thinking in English and then speaking in Dutch. Nowadays, I dream in English. Here's an idea of my current setup. I've since added 4 more of the grey modules to fill in the top space and I have another black module on the other side of the table. The Bionicle parts are in bins because I don't use them much and they take a lot of space. For my part, the system is ever evolving. The size of drawers I use and the level of sorting depends on the parts I have. Most sets I buy cause some level of reorganizing. Right now, technic takes about two black modules and a few bigger drawers for the large parts. Note that I'm mostly a system collector, I only have a handful of technic sets. I use a similar approach for sorting system bricks. Some types of bricks used up a single small drawer when I first sorted and now fill up most of a module. I find that the key is having many sizes of drawer to accommodate the reality of your collection. and the boxes on the drawer is the very large parts such as the baseplates, train track, boats and all the Lego dimension kits are in the boxes below. Here goes everything that doesn't fit in a small drawer so it's mostly bricks and plates but also large wheels, battery boxes, train track and train carts, castle walls and trees, there is some technic here also. This is how one of those 192 drawers look like inside. currently only one is empty the rest is filled much like this one. Depending on what you build and what color you fetch them and put them next to you on the desk. The big bins are already close so I just leave them in the bookshelf. I know the feeling. 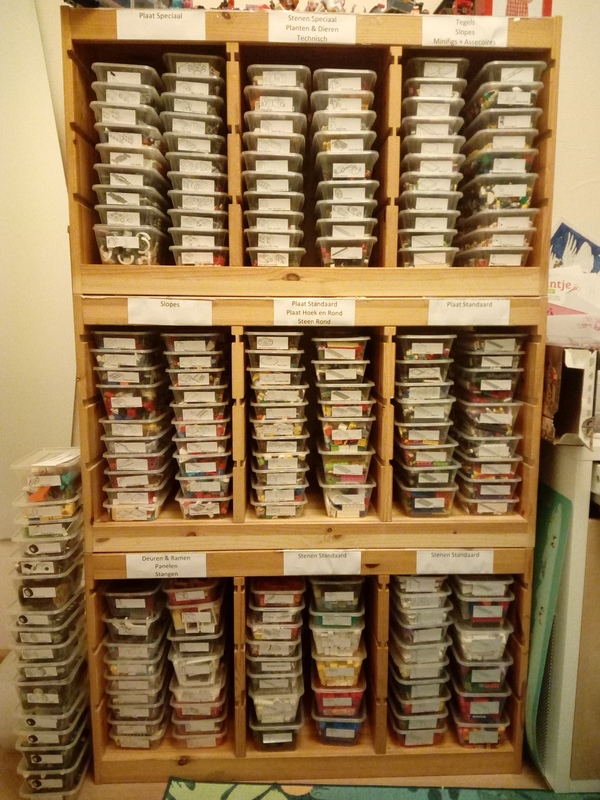 Though globally, it's not the case for me, since moving to the house, I probably spent more on LEGO storage than on LEGO itself. I hope I'll be ok for a while now. Out of interest how many elements are you managing to store in setups like this? According to my Rebrickable inventory, 72170 parts. For my part, I mostly build stuff I create myself. So my main sources of parts are sets that have parts I want and Bricklink lots from sellers who have parts I want. Most of the time, I don't yet know what I'm gonna do exactly with the parts, just that they might be useful for my style of construction. I do sometimes buy sets because I want the se itself but it will inevitably get added to the part reserve eventually. As for keeping models built, it depends greatly. Some sets I kept built for many months before breaking them up for parts (like the fishing store). Others will be built once, just to see it and confirm I have all the parts and will be taken apart pretty much the day after. It'S similar for my MOCs. Some I build for fun, take a picture to remember and break them apart shortly after. I tend to keep them much longer if I intend to bring them to shows. Some of my steampunk MOCs have been built for a few years. For some of those I didn't want to loose, I made photo instructions as I dismantled them and entered them as MOCs on Rebrickable. That way, I can rebuild them later if I want. Right now, I'm in the process of taking everything apart because I want to build something with all my parts available. My collection grew a lot since building some of these so I never actually had all these parts available at the same time. well the fastest and cheapest way to build up a collection of parts is buying big second hand lots on flee market and ebay sites. it means a lot of time sorting, and working on your collection, since you can't really just import the result of your order. it also means a lot of incomplete sets, which isn't a problem if all you want is a lot of spare parts otherwise it a good idea to start shopping on Bricklink for the parts and pad your orders with parts you like or want for MOCS while picking up the missing set pieces. It's relaxing, it's far better then meditation and yoga. Don't mind it at all but it also lead to having to shop for more boxes and storage containers quite often. I guess you could sell what you get to much off, but never reached that point and I have two big boxes full with red 2x4 bricks. Can you have to many of those? Can you have to many of those? Thanks, We've got about 50,000 part at the moment although 10% of those are Ninjago City so it looks like We'll need a similar size setup.